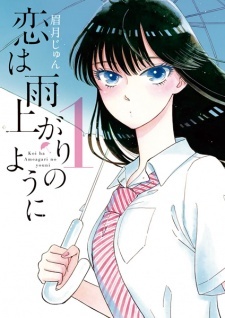 In 2016, Koi wa Ameagari no You ni placed fourth in the Kono Manga ga Sugoi! ranking in the male readers category. The series has been licensed in English as After the Rain by Vertical Inc., in Spanish by Ediciones Tomodomo, and in Italian by Star Comics. An injury, the fear of writing again... What do these two things have in common? Yes, they prevent you from pursuing what you want to do, and leaves you stranded alone while everyone else is moving on, as if time itself has stopped. Revolving around the conflicting themes of moving on to pursue what you love or staying still for love, this is a beautiful allegory of life and regret. I'm pretty sure that this manga is not mainly about romance. Although the theme of love is there, it is not as important compared to the main characters' interests and their decisions for the future. Akira Tachibana is the best runner in her track club who has to take a break due to her ankle injury, and Masami Kondou is a family restaurant manager who has given up on literature due to various personal reasons. With an age gap of 28 years (Akira is 17 and Kondou is 45), this manga tries to show the audience a different kind of relationship compared to what some people may think as a "normal" relationship. It is one where both help each other to reaffirm their thoughts for them to live the lives they want. For me, any misconceptions about their age gap has successfully been removed through Kondou's personality. In the first few chapters they show how he gets scolded by his workers and the way he can't really handle his job. He is a very kind person and cares for his workers despite their criticism. Tachibana is rather blunt with her words, and seems more mature than others, except of course in "love", which she has experienced for the first time. Although they are somewhat similar I felt like they were a really good match allowing them to learn something from each other. The symbolism of rain was very interesting in this manga. In fact, the reason I started reading this was because of the rain/umbrella on the cover. Obviously there's the melancholic but also refreshing feel, but in this case I think there was more. For me, it represented the length of Tachibana's injury or recovery, because when they first met: Kondou tells her: "I'm sure that it'll stop raining soon.". Now at this point he doesn't know that Tachibana is injured, but you can still say that he wanted her to go back and continue to live her life. The use of metaphors was really impressive as well, for example the polished sea glass, the Rashomon story and the bookmark with the swallow. They helped a lot to emphasise this theme of making a decision, whether changing something or not. From unlikely things the author managed to connect them with the feelings of the characters. Fitting them into the plot itself mustn't have been an easy task either. Maybe it's just me who's bad at making metaphors but honestly, there were really good. The reason I gave this a 9 and not a 10 is mainly because of the ending. It felt abrupt, and basically you could predict it from the start. However I do think it was appropriate and I guess you could say it was a beautiful ending. I love the rain. I tend to try to find any manga with covers showing rain, despite the famous saying "Don't judge a book by its cover". And this manga perfectly nailed it in showing raining scenes. I don't ask for much, but there's this feeling that you get from looking at raining scenes and you really think you're there, you can hear the monotonous susurration or the heavy pattering sound. This was a perfect example of it. Of course, rain wasn't the only good part of the art. I mostly felt like the art (overall) was cute, creating a relaxed atmosphere (except a certain point in the manga where I got really angry at a certain character. Manga readers/Anime watchers should know exactly what I'm talking about here). I also have to mention the eyes... Wow. especially Tachibana's eyes. They are simply mesmerising. I completely fell in love with Kondou's inspiring lines throughout the manga... The one I showed at the start was just one of numerous examples. He is often cheerful (although he does lament himself for all the bad things his workers say behind his back) and a good father. Thanks to Tachibana, he experiences the youth he thought would never see again and this leads to building his courage again to write once more. Tachibana is someone who still doesn't seem to know the real meaning of love, I think it's more of an admiration, and that's why I always thought that her relationship with Kondou as "friends" was interesting. Although she could be misunderstood to be a cold-hearted person, she is innocent and caring. Her interactions with Kondou shapes her choice to start running again as the manga progresses. Lovely character who truly cares for Tachibana, as her long-time friend. She wants Tachibana to get back to running and does a lot to convince her. A lot of development between her and Tachibana, including flashbacks. Co-worker at the family restaurant, same age as Tachibana. She quickly becomes friends and talks a lot about her love interests and gets advice from her. I think she was an essential character to affect Tachibana's thoughts on getting back to running. Would've been great if they showed how she was at the last chapter, but I guess that's asking for too much. He loves Tachibana, but it is unrequited. Annoying is probably the best word to describe this guy. I don't think he was particularly needed in the story (ok maybe at one point). Worker in family restaurant, in his 20s. I think his interaction with his sister was very interesting but the author didn't go deep enough. Give it a try unless you absolutely hate big age gaps no matter what. It had been a long time since I hadn't felt this way. I was brought to the manga by the anime and I really have no regrets about it. So first thing that shocked many people: there is an age gap. I think it'd be better seen as a forbidden love STORY than trying to imagine it in real life.. The art is wonderful, and the story has a good pace (though some people might find it too slow). The mangaka takes the time to deepen other characters too. Things happen naturally and not too fast, it makes you crave for what's next and suddenly you realize it's over. It was a beautiful love story. Koi wa Ameagari is all about pushing yourself towards the finish-line of happiness no matter what hurdles stand in your way. Yes the premise of an adult-teen romance is uncomfortable, but it's actual portrayal of the controversial subject is handled with care and deep introspection. Not once does Koi wa Ameagari make light of the fact that it's main characters are 30 years apart. It wants you to understand that the two are facing a monumental hill in order to ever be together and have it's characters make commentary on the issue as it relates to society - especially the adult. The 45 year old manager Kondou is as kind a soul can be. Even to the degree of ridicule as fellow employees consider him to be a pushover, with the exception of a young waitress who is infatuated with his sincere nature. He struggles immensely with handling her affection and is at an utter loss as to how to answer it, in addition to dealing with skeletons in his past that have led his life to become what he deems a disappointment. Despite a heavy weight being placed on his shoulders, the manager is a delightful personality who often makes jokes at his own expense and treats everyone with care. It is easy to understand why Akira fell for him. Lead character Akira is a stunning character - both in appearance and spirit. Her blunt, matter of fact attitude is a refreshing contrast from the usual lead characters of romance works and is quite frankly admirable. It takes a special person to go for what they want in this world without worrying about the consequences. In great contrast from the manager, Akira has zero awareness of the societal concerns of a relationship between people in different age brackets. The only thing she cares about is pursuing the one that she loves, the person that helped to save her in a period of great depression, and nothing more than that. If there were a manga Top Model competition, Akira would be a strong candidate to win first place. Her design is nothing short of flawless - given a slim athletic build, piercing eyes and a slender face. The fact that she looks like a young woman rather than a child does help the reader become more comfortable with the romance, which is not at all fetishized. Jun Mayuzuki's debut manga is a strong one - crafting a beautiful seinen romance that shows all the promise of finishing as a classic of the genre. Try not to let the premise be an obstacle, give this story a serious try and you're likely to enjoy whats inside. The question which you can answer... Is it alright to accept her love with someone like her on that current age? Although you may not see that every second since the day you met her.. It would be kinda nonsense to know what are those genuine feelings are.. Even so, Right now He want to unburden her of her suffering. He wanted to secure the fact.. that she deepenly hurt.. Even he's not worth enough..
Possible That Mutual Affection wouldn't call "Love"
Hopefully.. That this romance could mesmerize your inner interactions once... you'll be able to know the strong affections... or whether you pull out the strings you kept inside of it..